There is an exhibition from my works in the Mandala-Gallery, Füzesabony (Baross str. 10) from 2007, Oct. 12 till 2007, Nov. 17. This event is the result of a new friendhsip that was born in the workshop at Felpéc. 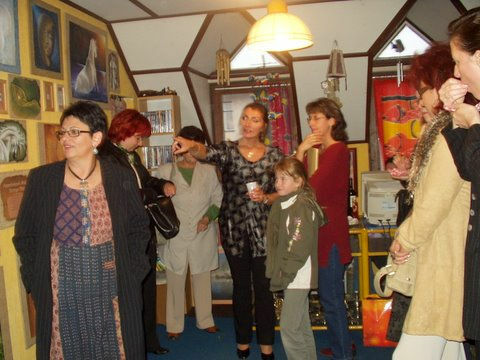 The hostess and colleauge - Éva Antal artist - invited me to show my works here. I had the privilege of taking part in a workshop between the 1st and 15th of September, organized in Jelsa, Croatia. The wonderful mediterranian milieu, the sea and the cultural, architectural relics of the island inspired the artists. A collection of the works created there was selected for an exhibition held at the building of the National Agricultural Library (Budapest, Atiila u. 93) between the 3rd and 25th of October. I took part in an international workshop between the 1st and 12th of August, invited by the "Foundation for Felpéc". The cosy, glad, warm mood and the calm beauty of the Felpéc landscape created the ideal environment for inspired work and making friends and professional contacts. There are some photos taken during the workhop.